If you would have went through my Eggless burger buns recipe, you would have noticed that i told that i served my softy,spongy burger buns with something interesting rather than the usual tikkis. Now you know how i served my eggless burger buns for our dinner. 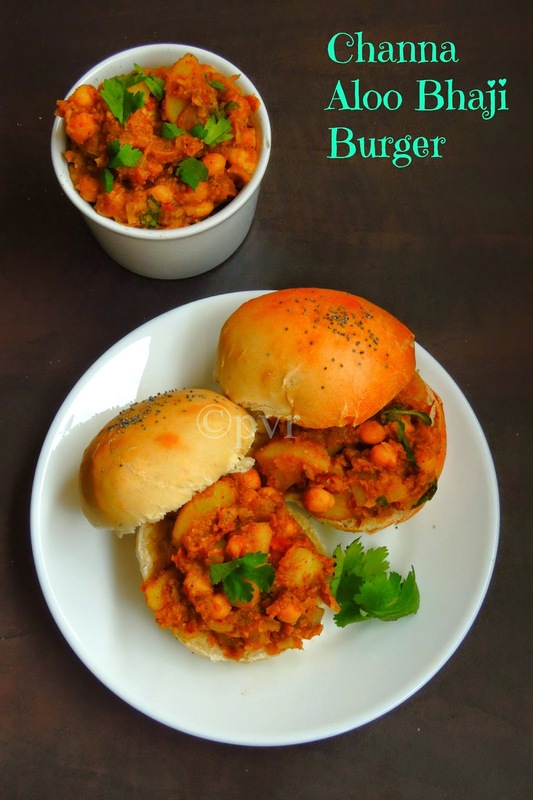 Yes i simply prepared a nutritious channa aloo bhaji aka chickpeas potato curry as much similiar like our humble 'Pav Bhaji' and served the burger buns along with. The sweetness of this buns merge very well with the spiciness of the bhaji and we had a super filling dinner with these both dishes. You can serve very well this semi thick bhaji as side dish with toasted burger buns or simply stuff the buns with the bhaji and enjoy as a sandwich. However we had them as sandwich, even my lil one who is not big fan of chickpeas enjoyed thoroughly this super filling fusion sandwich. Since this buns are super spongy, this burger sandwich wont turn soggy hence you can carry this burger very well in your lunch box. 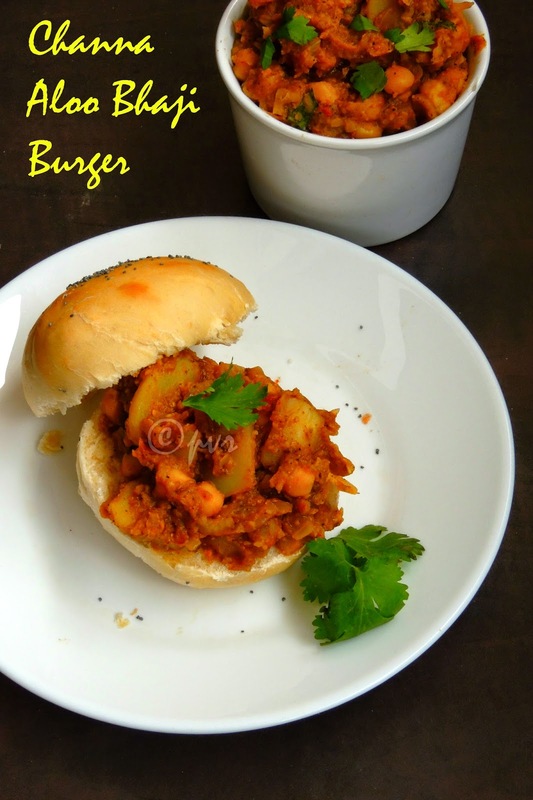 Definitely this sandwich is a kid's friendly dish, since potato is added in this curry, am sure kids will enjoy thoroughly this super filling sandwich.This bhaji can prepared easily if you have some already cooked chickpeas and potatoes at home, just throw everything in a pan, add the pav bhaji spice powder,thats all. As i used grounded chickpeas along with whole chickpeas, this bhaji tends to turn semi thick, needless to say if anyone at home doesnt like chickpeas,you can feed them easily this way without their knowledge.Check out the Blogging Marathon page for the other Blogging Marathoners doing BM#45. Heat enough oil and fry the ginger garlic paste and green chilly paste until they turns slightly brown, add the chopped onions and saute till transculent. Add immediately the tomatoes, salt and cooking until the tomatoes turns mushy. Now add the cubed and mashed potatoes,cooked chickpeas, red chilli powder, cumin powder, coriander powder, pav bhaji masala, cook for few minutes. Meanwhile grind the quarter cup of chickpeas as fine paste. Add a cup of water, grounded chickpeas paste and cook everything until the bhaji turns thick. Put off the stove, garnish with coriander leaves. Serve this bhaji with the buns either as sandwich or simply as bun with bhaji as side dish. wow..what a filling and delicious burger, will finish it in no time :) tempting preparation.. Very novel way of having burger buns. Love it! 33 cups or 3 cups? Lovely idea to accompany the flavorful curry with these buns. 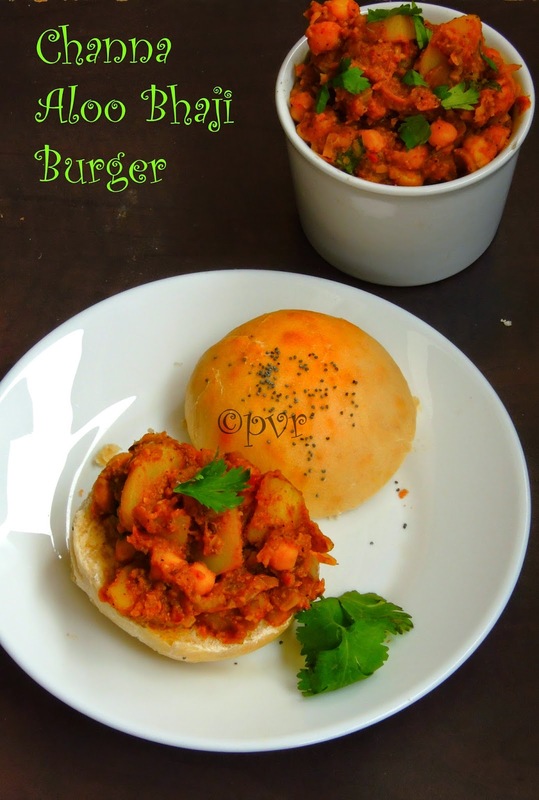 The bhaji looks so delicious and what a perfect way with those amazing buns. @Unknown , its a typo, 3cups only.. Very easy and tasty barger. Love the twist. Thats a clever post thats super yummy!! I am sure kids would have been thrilled with this version of burger! love the filling n delicious burger !! Le burger le plus original que j'ai jamais vu. Il doit être délicieux. What a tempting sandwich. Love that filling -- sooo good. Lovely idea.. will try next time with buns..
Wow what a tempting burger. Really drooling over your home made buns with this subzi. Looks and feels divine. Hmmmmm....Heavenly food i could say.